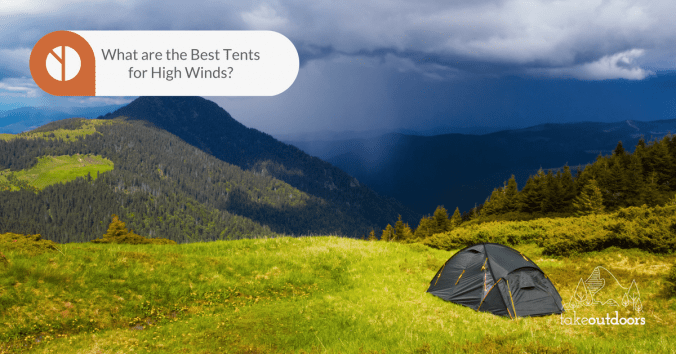 What are the Best Tents for High Winds? If you’re planning to camp in a high-wind area, then you’d better find a tent that won’t collapse on you in the middle of the night! There are various features that give a tent more durability in high winds, including the shape. It’s always convenient to have a tent with plenty of headroom, but you may have to sacrifice some of it in a location with high winds. The lower the profile of your tent, the more protection you’ll have from sudden gusts of wind. A good rule of thumb is to choose a tent with enough height that you can hang a lantern from the ceiling and attach gear to a few loops along the edges without feeling cramped inside. Remember that your boulder-shaped tent will have sloping walls that leave less room for campers, and choose the footprint size accordingly. Having two doors in a tent can be a convenience, but you don’t want this in an extremely windy scenario. Ever heard of the ‘wind-tunnel effect’? That’s when air enters through one opening and is pulled through another, and in high winds this can lead to pressure on the walls and stress on the seams of your tent, causing it to become unstable. Make sure that windows can be closed, the door seams are sealed, and there’s a flap over the door zipper to reduce wind drag. You’ll still want a garage or vestibule in front of the tent door to keep the interior of your tent clean and orderly. If you get a lot of rain, it’s the place you and your fellow campers will leave muddy shoes and wet rain slickers. And it adds an extra layer of protection to keep icy drafts from blowing into the door of the tent in winter. For a wind-resistant tent, you’ll have to stake out your vestibule as securely as the rest of the tent. If you don’t, it could cause wind drag that shakes the tent and pulls the walls out of alignment, and that would be very inconvenient! For the average camper, a tent with single walls is lighter, less bulky and easier to set up. But if you’re going to be camping in high winds, you’ll want to opt for a double wall tent. They’re stronger and hold up better in the wind, with a breathable inner lining and a sturdy outer shell that resists bad weather. Heavier fabric and proper staking will resist the incessant flapping that can drive you up the wall and make sleeping impossible. The more tent poles, the more wind resistance your tent will have. This adds expense and weight to your expedition, but you’ll be thankful for the extras in the high winds. Aluminum tent poles are great for weekend campers because they’re strong and lightweight, but they’re not the best choice when setting up your tent in a windy location. Fiberglass poles are heavier, giving your tent more resistance against the wind. They break more easily too, but if you get them with shock cords inside, they’ll be repairable in a pinch with duct tape. One feature that adds strength and stability no matter what kind of poles you use is having sleeves for the poles instead of tie-downs or clips. It takes longer to set up a tent with sleeved poles, but it’s well worth it for high-wind camping. When it comes to stakes, the longer they are, the more support they’ll give your tent. And though v-shaped or y-shaped stakes are harder to get into the ground, they have much better staying power, and are a must for high-wind camping. To give you the widest range of choices in a wind-resistant tent, we selected a mid-size and large tent in each of the three price ranges. 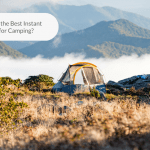 All of these are excellent high-wind tents and, although you’ll get more perks from the high-end ones, not everyone has an unlimited camping budget. It all comes down to what you can afford and the degree of roughing it you plan to attempt. This 4-person tent doesn’t have sleeved tent poles, but it does have a ventilated rain fly that completely covers the tent on all sides. The setup is easier using pole clips, and the poles are made of fiberglass, a material that, although not as durable or heavy as steel, does add weight to the tent. This helps when a strong gust of wind tries to blow your tent away! The tent has a fairly low profile of 52 inches in the center, and that cuts down on wind resistance. The Taurus does have two doors, but both of them have vestibules, which is a plus. It also has factory-sealed seams and a weatherproof coating. A queen-sized bed can fit inside, but with only about two feet left for gear. The wire stakes aren’t going to cut it in high winds, though, so you’ll want to invest in upgraded ones. Like the ALPS Taurus, the CORE Dome Tent has a rain fly that covers the entire tent. The center height is 72 inches, but the roof of the tent slopes down to two extensions on each side, giving it a lower profile than the main height would suggest. Although the poles are made of fiberglass, they do have shock cord inside, making them harder to break. There’s a lantern hook in the center, pockets along the walls, and a hammock for lightweight gear suspended from the ceiling. There’s also an electrical cord port near the front door. The CORE only has one entrance which is a plus for a windy campsite. The tent is roomy enough for two queen air mattresses with plenty of room to spare. Feedback from users indicates it holds up well in high winds compared to some other tents and is easy to set up in as little as ten minutes. But this tent also comes with stakes that won’t stand up well in high winds, so you’ll have to buy better ones. 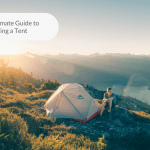 This tent is similar to the ALPS Taurus in a few ways: it’s a dome-shaped 4-person tent with a rainfly that provides complete coverage, and it has two entries with vestibules. The Slumberjack has fiberglass poles with shock cord and there’s a bit more headroom at 59 inches in the center. It also has handy interior storage pockets, but the rain fly isn’t ventilated. There are a few loops and connectors attached to the ceiling. The square-footage is slightly less than the Taurus, and it’s a tight fit with two sleeping bags. It’s recommended that you stake the mid-points of each vestibule fly for ventilation. Users rate the Slumberjack highly on ease of setup, and the color-coded clips help with this. As with the two entry-level tents, you’ll need better stakes for high winds than the ones that come with it. This is an 8-person tent with 74 inches of headroom in the middle and one door. It includes a fully ventilated rainfly with heat-sealed seams, coated with polyurethane and aluminum. There’s no vestibule, but the door has an overhang of several inches. The poles are described as a special NANOFLEX fiberglass with shock cords. The interior tent has extra-fine mesh to keep out the "no-see-ums", and there are interior pockets for storage. A couple of extras are an anti-fungal floor treated with a thermal silver coating and a tub-design that keeps water out more effectively. Several users were happy with the fact that the rainfly extends all the way to the ground, and the interior is described as well-ventilated. It’s large enough for two queen-sized air mattresses with plenty of room left for gear. 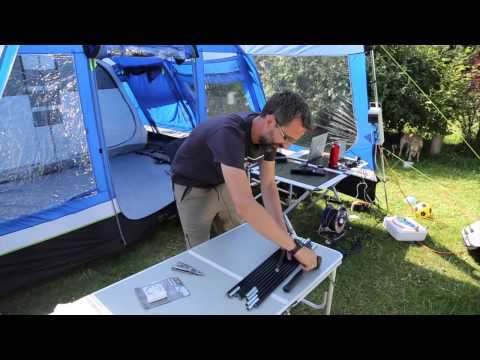 Setup is easy, and one user had the tent set up and in use for a year with no problems. Another reported no leakage despite rain with wind gusts of up to 70 m.p.h. The manufacturer says that NTK tents were designed for the harsh conditions of the Amazon rainforest. The only drawback is the lack of a vestibule in front of the door, but this can be remedied with an extra rain tarp over the entrance. The Pacific Crest compares to the ALPS Taurus with 53 inches of headroom, but it has the smaller footprint of the mid-range priced Slumberjack. It has the lightest weight of the three tents at almost a pound lighter than the Taurus. The manufacturer says it was designed to be stable in high winds and support a light load of snow. The tent has fiberglass poles and the complete rain fly forms a 3-foot-square vestibule in front of the one door. It has a tub-style floor and a place to hang a lantern from the ceiling. 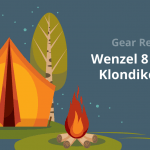 Like the Slumberjack, this tent would be better described as a 2-person model, but the spacious vestibule gives extra room for gear and shoes. It’s not as easy to set up as the other small models because of the extensive rainfly/vestibule, however. Two problems mentioned by users were inadequate ventilation and leakage in a heavy rain. For wind resistance, using multiple stakes for the inner tent and rainfly/vestibule could give extra support. 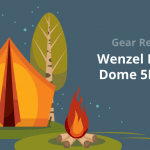 The Arizona is a bit larger than the entry-level CORE Dome 8-person tent. It’s a two-room tent with divider, and it has a 72-inch ceiling height that extends for most of the interior. There’s a full-coverage rainfly with ventilation and heat-sealed seams. It has shock-cord NANOFLEX fiberglass poles like the NTK Laredo. This model also has the anti-fungal floor with thermal silver coating and a tub-design to keep water out more effectively. There are storage pockets in the sides and a light gear loft. The three windows and two doors each have a slight overhang to keep out rain, in addition to the protection offered by the complete rainfly. With over 140 square feet inside, it will truly sleep 8 campers with enough room for gear. The shape is streamlined and rounded on one end, allowing you to set it up in the best direction for the wind. Users have reported easy setup and the ability to have it up for weeks at a time with no weather issues. Of the smaller tents, the ALPS Taurus was the only one large enough to really be considered a 4-person tent, although the other two advertised that they were. It also had a lower height which, combined with the larger footprint, gave it more wind resistance. It did have two doors, which was why we knocked a half point off of the wind resistance score. On the other hand, the two vestibules were a bonus. The CORE Dome Tent was long and narrow, and the rainfly didn’t reach all the way to the ground. The anti-fungal tub floor in the NTK tents was one feature that we considered to be important for high wind and rain. The NTK Laredo was very similar to the upgraded NTK Arizona, yet it had as much room inside. It also had the wind-resistant boulder shape we were looking for and the best dollar value of the three larger tents. With all these great features, I guess you could say it blew us away! What are the Best Board Games for Camping? 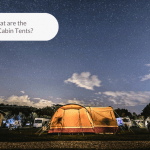 What are the Best Cabin Tents?